Really interesting thoughts — thank you for sharing! 1. Special development zones, where the city agrees to simplify or expedite the planning process to encourage housing creation. 2. Offering low-cost financing directly to builders on condition that they sell units at or below a certain multiple of cost. 1) intermediate-term building, i.e. temporary. 2) Mobile or “agile” housing. 3) Reallocating land from current uses, particularly from vehicle & parking use. I have a project I call “houselet” or “Startup House” to prototype mobile microunits that may fit on standard parking units. Park of the motivation is the observation that even in such fiercely regulated and land-use-contentious places as San Francisco, huge areas of public land are basically being given away for private enclosure as parking. As Shoup’s “The High Cost of Free Parking” argues, our cities are in effect structured around parking practices, with resulting remarkable misallocations of space and resources. While a long-term rethinking of such land uses is clearly under way, I’m interested in the potential of interventions such as “Startup House” to accelerate new thinking & practices and solve immediate problems like tech-worker housing. Among the precedents I’d cite are post-emergency situations, in which large numbers of low-cost units are often created, such as after San Francisco’s 1906 earthquake. I’d suggest the current rapid escapalation in SF housing prices is likewise a large-scale civic crisis — although one of highly disparate impact, e.g. to current residents/landowners vs. to future residents & non-owners. Considered as a crisis or extraordinary situation, it might warrant extraordinary intermediate-term measures. I also find it interesting and opportune that major tech employers like Facebook and Google, as well as Stanford, are now highly concerned about housing and traffic-impact issues. So part of the Startup House idea is to propose mobile micro-units as flexible live/work-space units for the high-growth, high-mobility needs of such organizations. I am currently researching many precedents and current practices related to this, and considering various avenues by which to pursue it. For example, a “houselet” international design contest sponsored by SF Mayor’s Office of Innovation (winner and me get a space to live on! ); a demonstration unit for Google or Facebook or Twitter campuses; and building and living in my own prototype unit, in Palo Alto or SF. More info: “Parking Houses: modular housing to fit on city parking spaces” http://tjm.org/2012/08/30/parking-houses-modular-housing-to-fit-on-city-parking-spaces/ (August 2012). thanks for opening the discussion. Onwards & upwards (& smallwards)! 1) The biggest factor in price is the hard cost per unit, which you estimated at $240k. How much lower could we get by sticking to 4 stories/no parking, removing need for elevators? How much less if we elminate HVAC (rarely needed in SF)? 2) To ameliorate the $100k+ land cost, how could we get that land into a community land trust? 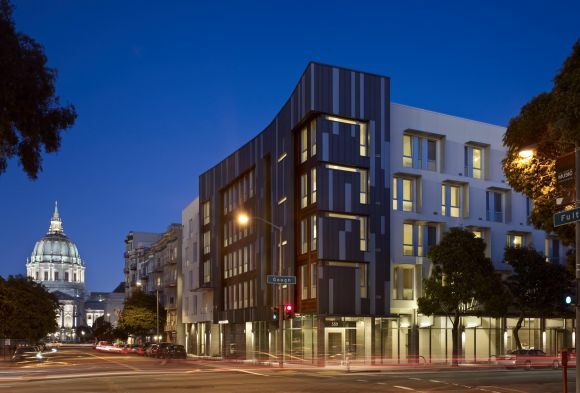 3) Regarding neighborhood opposition, I’d guess there would be less if units were 100% affordable, and parking concerns would be less on sites like 16th/Mission w/ great transit. 4) Most of the other points you make about streamlining the permit process, eliminating the BMR fee if we build 100% affordable, are good things to consider. 1. You can’t eliminate elevators per the California Building Code. Most of the building would not be accessible to people with disabilities if you did that. You also need to provide heating per the building code, many new buildings (even many high end ones) do not have air conditioning here unless it is part of a ventilation system that is required by code (there are code requirements based on local air quality etc). Many of the hard costs are locked in based on state regulations. 2. I don’t know- the land is under private ownership for most parcels and the city would have to buy it. If, for example, the City was able to get the 280 freeway removed there might be an opportunity for a land trust in that location. However, the infrastructure fees in locations like that would be huge. I am definitely in favor of less/ no parking too. San Francisco is very progressive on parking policy compared to most places though- we have parking maximums instead of minimums and parking has to be unbundled from units in new housing. the trouble is the capitalist system,as soon as a labor or material saving system comes along,somebody jacks up the price to make a killing and we are back to square one!